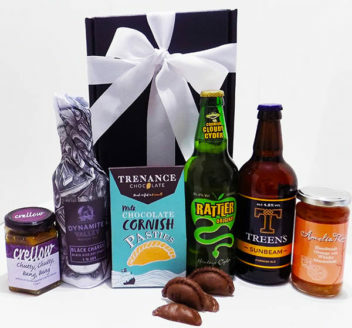 Our Just For Him Cornish Hamper is a lively bright selection packed full of fabulous treats! For those who appreciate great traditional ales, authentic ciders and delicious hand crafted sweets and treats it’s definitely a winner! Rattler cloudy Cornish Cyder with a bite! Looking just like a Cornish St Piran flag with a lovely surprise inside! Includes your own message on a handwritten Cornish themed Greetings Card. All products sourced within 20 miles of the Cornish Store in Falmouth.